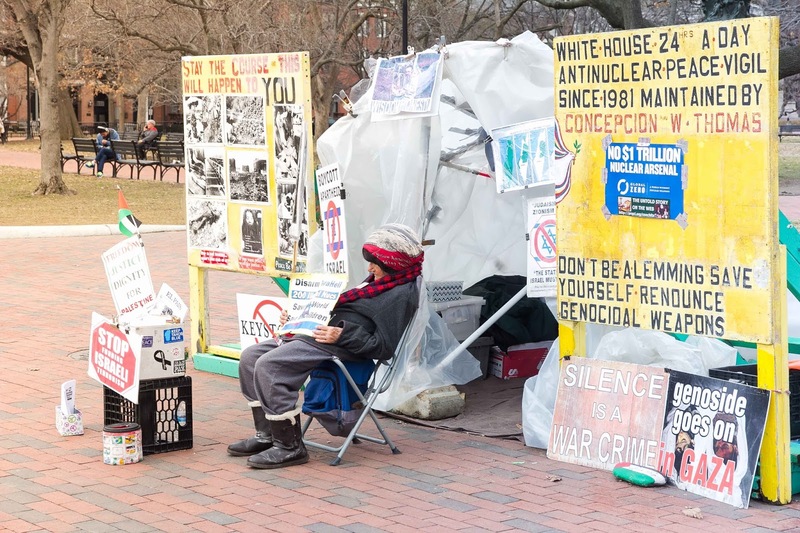 Concepcion Picciotto, the protester who maintained a peace vigil outside the White House for more than three decades, a demonstration widely considered to be the longest-running act of political protest in U.S. history, died Jan. 25 at a housing facility operated by N Street Village, a nonprofit that supports homeless women in Washington. She was believed to be 80. This news is terribly sad, what a great loss. She reached so many people with her message and fierce determination. I always stopped in to say hello to her whenever I went to DC. I am heart broken to read this news. I went up to Concepción and thanked her for her dedication. She quickly said to me, "People are such cowards. Talk, talk, talk.....we need action." I told her I agreed and thanked her again. She graciously thanked me in return. I walked on - stopping to look back from the center of Lafayette Park - I could see many people reading and reacting. Concepción (and William) long ago achieved the goal of getting their concerns under the skin of people from all over the world. Mostly importantly the White House, the home of the 'American illusion', has been unable to chase away a courageous old woman who suffers from skin cancer and lack of sleep. My heart and deep respect go out to Concepción. We need more like her.